Last week's "Basket of the Week"
Peaches are in abundance right now, we will continue to have them through the summer(if we get some rain soon). Blackberries are ripening now, we will have them for several weeks. We are now producing enough fresh produce to start taking order for our “basket of the week”, which includes a little bit of everything available the current week. 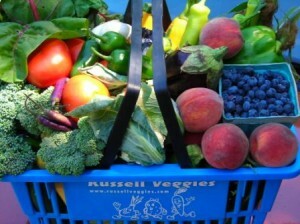 The “Weekly Basket” cost $25 and always includes fruit when available and you can also add fresh eggs to your basket. If you are interested talk to me on Saturday or e-mail me and let me know.